https://www.youtube.com/watch?v=CH1L5gfBGYU - violin and viola with slow motion. https://www.youtube.com/watch?v=VN6vkDp-L9E - "Vomit" exercise for cello. This Ensemble is for all seventh grade students. This class is the continuation from the sixth grade class. 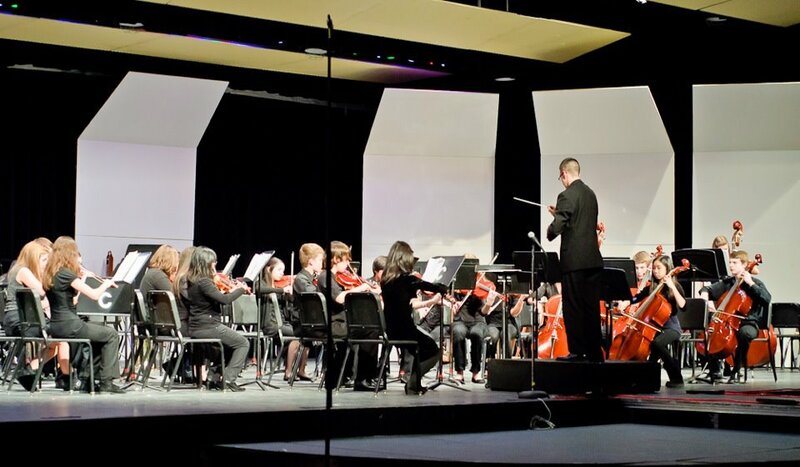 Eighth graders who have not taken Concert Orchestra joins this class. The focus of this ensemble includes learning the fundamentals of string instruments, basic music theory, ear training, basic rhythms, string pedagogy, bowing techniques, critical listening etc. This ensemble learns repertoire from grades .5 - 2. This Ensemble is for Eighth grade students that successfully completed Concert Orchestra with the completion of Essential Elements Book 1 and in process of completing Book 2. The focus of this ensemble includes the continuation of string pedagogy, advance music theory, music history, ear training, advanced rhythms, advance bowing techniques, critical listening, 1-2 octave major and minor scales, etc. This ensemble learns repertoire from grades 2-3. * Students are encourage to be practicing 15-20 min. a day in order to make progress in class and to further their skills on their instrument. Music Folder - Provided by Frost Music Dept. Pencil (1 to 2) Keep one in your case. Cello and Bassists will use school instrument, but need to rent one for home use. BOOKS: Method books mentioned above. 6. Don’t touch any other orchestra member’s instruments or equipment. 8. Orchestra class is for Orchestra music; don’t bring work from other classes. 9. No gum or food is allowed in the music room. 10. All other Frost MS and LPS district rules apply in orchestra class.